Many Australians flock to cities such as Melbourne. So too, do bees, as their wild habitats decrease in number. Image: Mark Higgins. 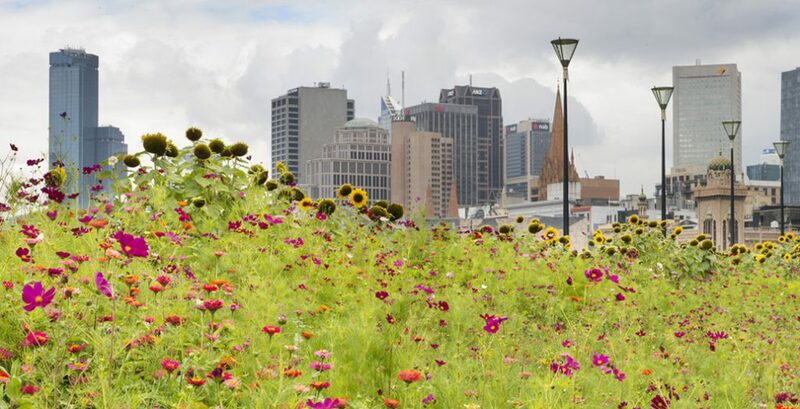 With bees threatened by habitat loss, pesticides, and climate change, researchers have discovered that flower patches in urban green spaces can help restore their numbers. The results are already being seen in cities from Chicago to London to Melbourne. The billowing stainless steel forms of Frank Gehry’s Pritzker bandshell seem to float up from behind the 3.5-acre Lurie Garden in Millennium Park, backed by Chicago’s celebrated skyline. Another landmark in a city long a laboratory for innovation in architecture and landscaping, the garden has been called a “model of responsible horticulture”. Masses of flowering perennials and grasses are a striking counterpoint to the surrounding walls of concrete and glass. Perhaps most unexpected, at a place that sits atop a 4,000-vehicle underground car park and railroad depot in the inner-city, are the bees that flit from flower to flower. In the 21st century, urban green spaces must be many things: verdant getaways, playgrounds, gathering spots. As cities continue to sprawl across the planet, leaving mere patches and fragments of wilderness in their wake, gardens increasingly must also serve as living space for native plants and animals. Not every species is amenable to city life, but from Berlin to Melbourne to Berkeley, researchers are finding that flower patches – in parks, residential properties, community vegetable plots, and vacant lots – support surprisingly healthy populations of bees, the most important pollinators in agricultural and most natural areas. In a few cases, urban bee populations are more diverse and abundant than those outside the city. 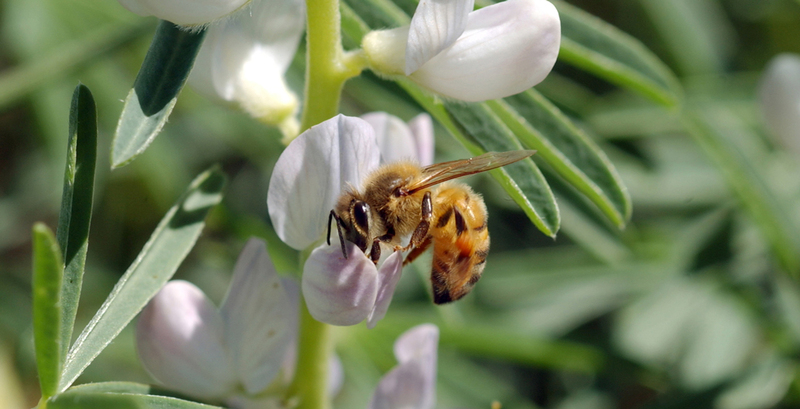 Bee on Lupin plants in Gundibindyal, NSW. Image: Carl Davies / CSIRO. 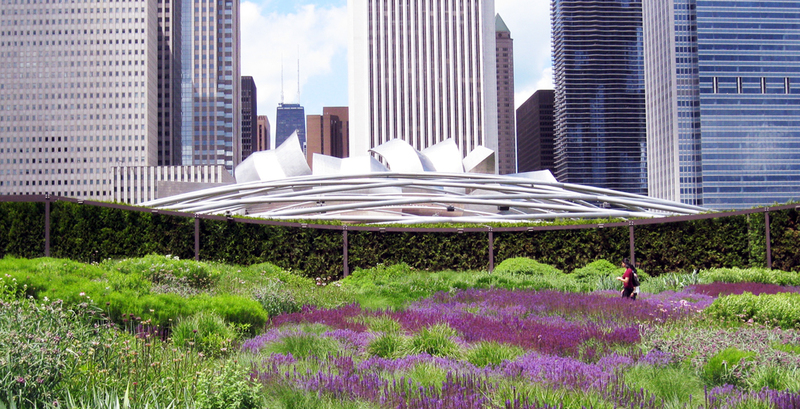 The vegetation of Chicago's Lurie Garden with Frank Gehry's Pritzker bandshell looming in the background. 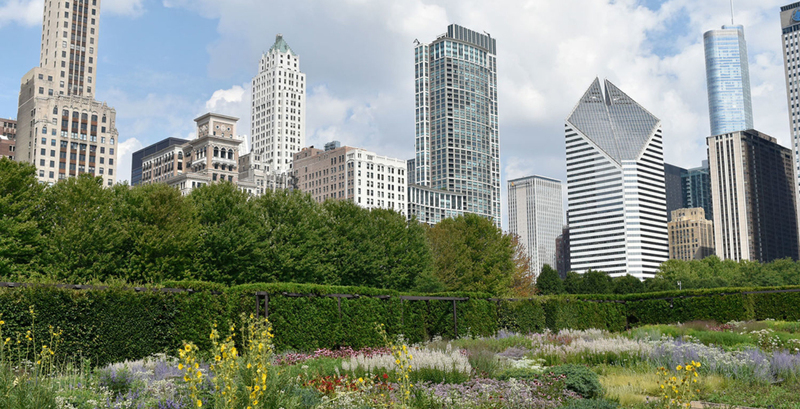 Chicago's Lurie Garden looking west: A lush paradise for the working-city-bee. In fact, as Rebecca Tonietto was surveying bees in Chicago in 2008, just four years after the Lurie Garden opened to much fanfare, she made a remarkable discovery. Among the lanky sunflowers and bursts of purple bee balm was Lasioglossum michiganense, an indigenous sweat bee never before found in Illinois, collecting pollen and nectar on the enormous green roof, the most urban of landscapes. Tonietto, a biologist at the University of Michigan-Flint, is co-author of a recent essay in Conservation Biology that points to research on urban bees as evidence that humans can share high-density habitat with other species. “Surrounded by increasingly less hospitable rural and suburban landscapes,” she and her colleagues write, the city “can become a refuge” for the bee species and other insects that are suffering significant declines. “This means we can do some real conservation in cities,” not just public education and outreach, says Damon Hall, lead author of the essay and a biologist at Saint Louis University. “Surrounded by increasingly less hospitable rural and suburban landscapes,” she and her colleagues write, the city “can become a refuge” for the bee species and other insects that are suffering significant declines. Amid the heartening news about urban bees, however, some uncomfortable questions are being raised. Can the non-native plants used in most gardens harm remnant native plant populations in urban settings, many of which harbor threatened species? And are urban gardens encouraging the spread of aggressive non-native bees that could outcompete declining natives? Remarkably little is known about wild bees, an astonishingly diverse group of more than 20,000 species worldwide. In the US, bees range in size from the hefty carpenter bee to tiny Perdita minima, a south-western native less than two centimetres long. In addition to flowers, bees require places to nest. Unlike the European honeybee, which lives in hives, most bees are solitary and nest in tunnels they excavate in soil or wood. Image of a Queen bee. Image: Denis Anderson / CSIRO. 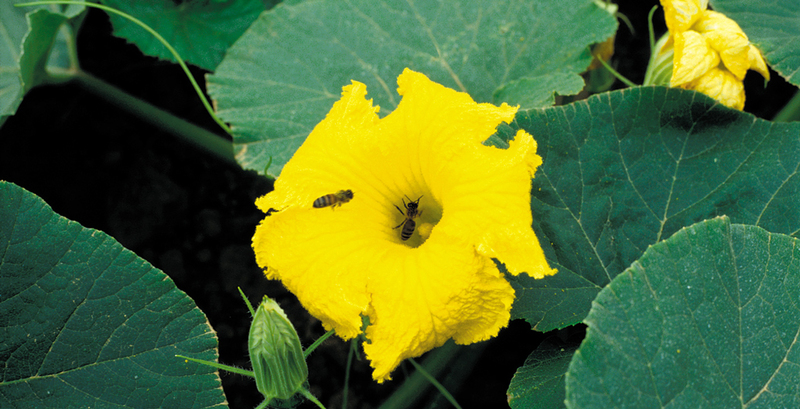 Bees pollinating pumpkin flowers near Clare, QLD. Image: CSIRO / Willem van Aken. 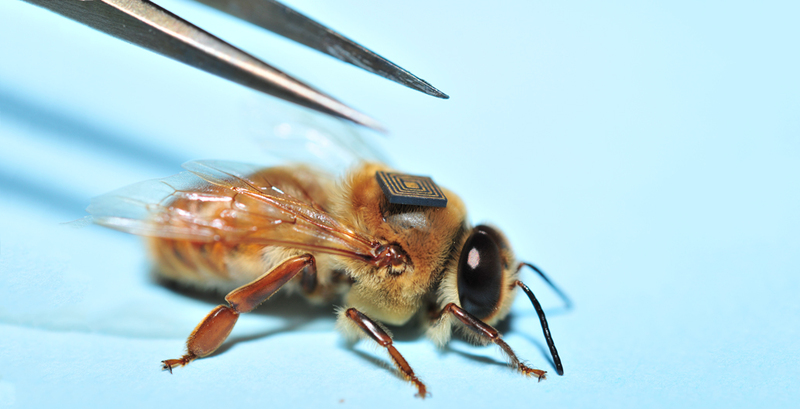 A sensor is placed onto the back of a drone bee, part of an experiment designed to improve biosecurity. Image: CSIRO. Imagine you are a bee attempting to navigate an urban landscape. If you are one of the many species that needs bare ground for nesting, you’re out of luck, since city soils that have not been paved over or obliterated by buildings are often covered by dense turf or pounded down and impenetrable due to human foot traffic. Flower patches must be within flying distance because you need to return to your nest several times a day carrying pollen and nectar – a task made all the more difficult by the fragmented nature of urban green spaces. Even if you are a diminutive bee that can fulfill all your needs in a small area, your nest may be so far from those of other bees that inbreeding and, eventually, local extinction are inevitable, says U.S. Agricultural Research Service entomologist Jim Cane. Even if you are a diminutive bee that can fulfill all your needs in a small area, your nest may be so far from those of other bees that inbreeding and, eventually, local extinction are inevitable. One big advantage of urban areas is that people, like bees, are attracted to flowers – “the key driver,” in Hall’s words, “of bee diversity and abundance.” Although the native vegetation has been all but wiped out, the diverse human populations in cities plant flowers from around the globe. That’s a boon for generalist bees, which are not fussy about flower forage. But if you are oligolectic, a specialist that requires pollen from one group of closely related native plants, or even a single species, you “are doomed,” says Cane. Scientists have also documented threatened species in cities. For instance, researchers who studied bees within a third of a mile from the centre of Northampton, a large, urbanised English town, found the nationally rare sharp-tailed bee Coelioxys quadridentata and discovered that overall bee abundance and diversity were higher in the urban core than in surrounding meadows and nature reserves. 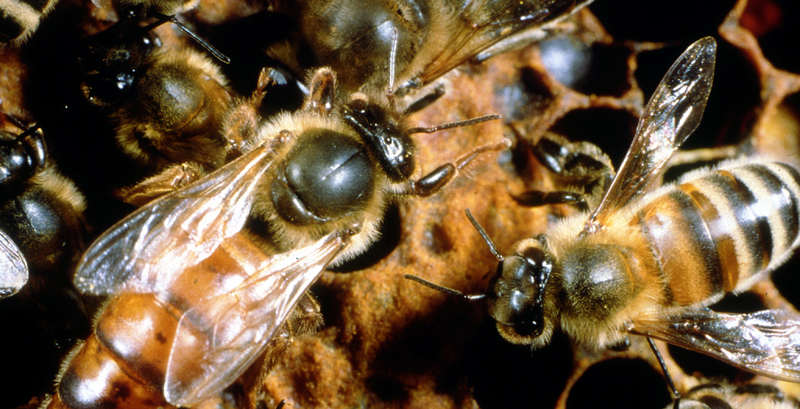 Half of Germany’s bees were discovered in Berlin. More than a century ago, landscape architect Jens Jensen spurred a homegrown rebellion, pioneering a new approach to landscape design in Chicago’s parks based on native plants and regional plant communities like those found on the prairie. Today, the debate over growing native or non-native plants continues. “The reality is that most urban and suburban gardens have had no or minimal natives,” says Mary Phillips, director of the US National Wildlife Federation’s Garden for Wildlife program. Educating the public about the importance of reestablishing native plant populations is a priority of efforts like Garden for Wildlife and the Million Pollinator Garden Challenge, she says. 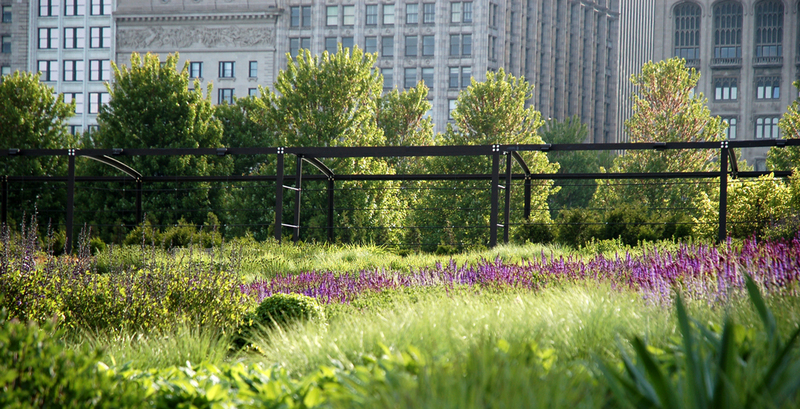 Lurie Garden in Chicago’s Millennium Park is a “near-native” representation of prairie habitat. 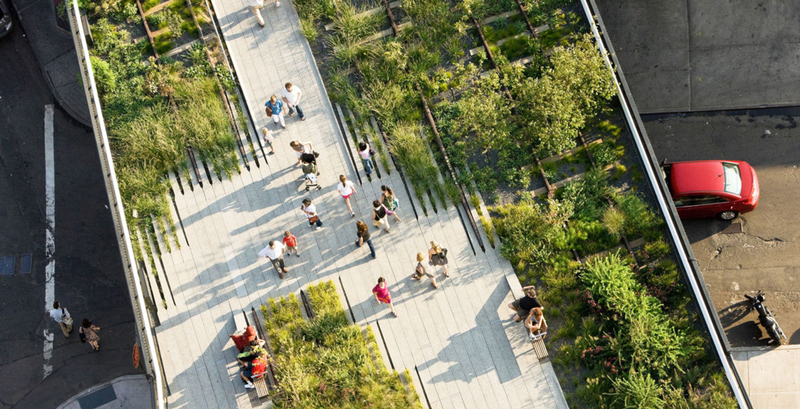 Image: Jo Ana Kubiak / Lurie Garden. 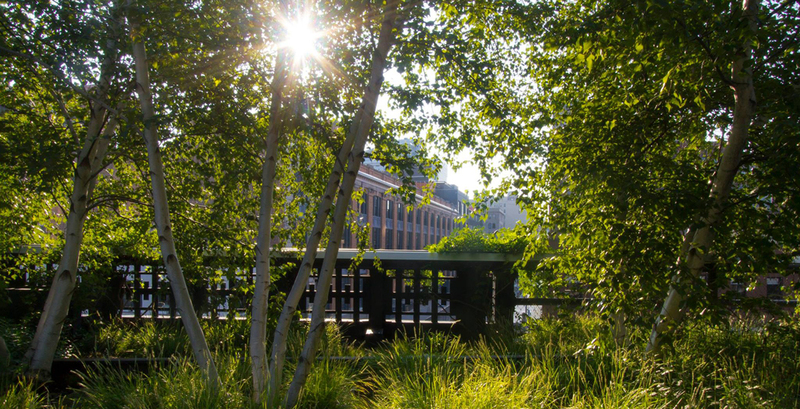 Gardens along New York City's High Line, a former elevated railroad track transformed into a linear park. Image: Friends of the High Line. Indigenous US grasslands on the High Line. Image: Friends of the High Line / Ayinde Listhrop. What’s more, in a recent paper in New Phytologist — “Considering the Unintentional Consequences of Pollinator Gardens for Urban Native Plants: Is the Road to Extinction Paved with Good Intentions?” — University of Pittsburgh biologists found that the non-native and native plants used for pollinator habitat could have a variety of deleterious effects not only on urban native plant remnants but also the native bee specialists that depend on them. Unless they are grown from seed collected locally — almost never the case in commercial horticulture — native plantings could swamp unique gene pools in nearby urban fragments. Even worse, the non-natives have a high potential to escape from cultivation. And as research has demonstrated, there is often a lag time of several years to several decades between the arrival of an exotic plant and the explosion of its populations, making it difficult to conclude that a non-native that has been innocuous for years is safe to plant. Exotic plants may also be favouring the non-native bees currently proliferating in cities. Scientists suspect that some of these bees may be poised to expand their territories and potentially displace native bees with widespread pollinator plantings. According to University of Virginia entomologist T’ai Roulston, an estimated 41 non-native bee species are currently in North America. One species that has raised a red flag is Osmia taurus, a Japanese mason bee that potentially could outcompete the native blue orchard mason bee, an important pollinator of apple and cherry trees. Exotic plants may also be favouring the non-native bees currently proliferating in cities. “I have collected more Osmia taurus at my field station than all but one of the nine native Osmia species,” Roulston says. Meanwhile, entomologists point out, in US cities the much-loved non-native honeybee consumes more floral resources than any other species, dominating native bees wherever a hive is nearby. Few scientists believe that urban habitats are a panacea for bee conservation, although they do support some important populations. In the words of Tina Harrison of Rutgers University, who studies the homogenisation of bee communities in disturbed landscapes, “Pollinators that are successful in cities are often very common in other habitats in the surrounding region,” and a focus on conserving them could divert much-needed funds from efforts to protect vulnerable bees. Conserving regionally rare or specialist bees that have found a refuge in cities, though, is probably a good idea, she says. There is unanimous agreement that much more can be done to make cities beneficial to bees by, for example, ensuring that there is ample bare, loose soil for ground nesters and following the French government’s lead in banning pesticides that are harmful to bees. In addition, bee advocates say that urban native plant remnants should be protected, and the planting of native species essential to the survival of beleaguered specialist bees should be a priority. This article first appeared via Yale Environment 360.